Afghanistan: are we embedding the truth? 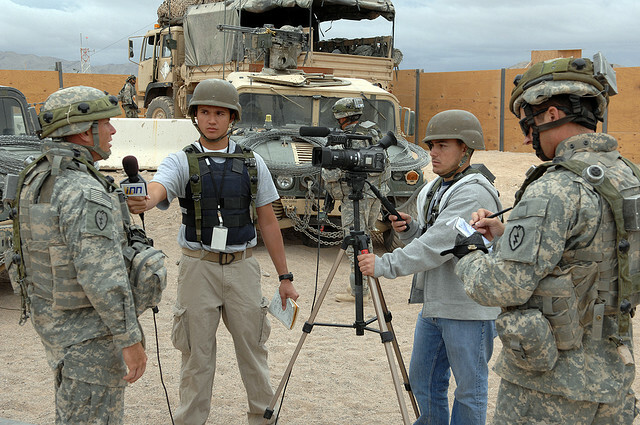 Alex Thomson (Channel 4), Stuart Ramsey (Sky News) and Jonathan Marcus (BBC) have all been confirmed as speakers for this week’s conference on journalism from Afghanistan. Conference organiser John Mair said he is “delighted to be co-operating with the BBC College of Journalism – the new kid on the J block in Britain”. Journalism.co.uk will livestream video and tweets from the conference from our site. For followers on Twitter, the tag will be #afghancov. The conference will take place on Thursday 18, at 1pm – 4pm in the Humber Theatre, Coventry University. 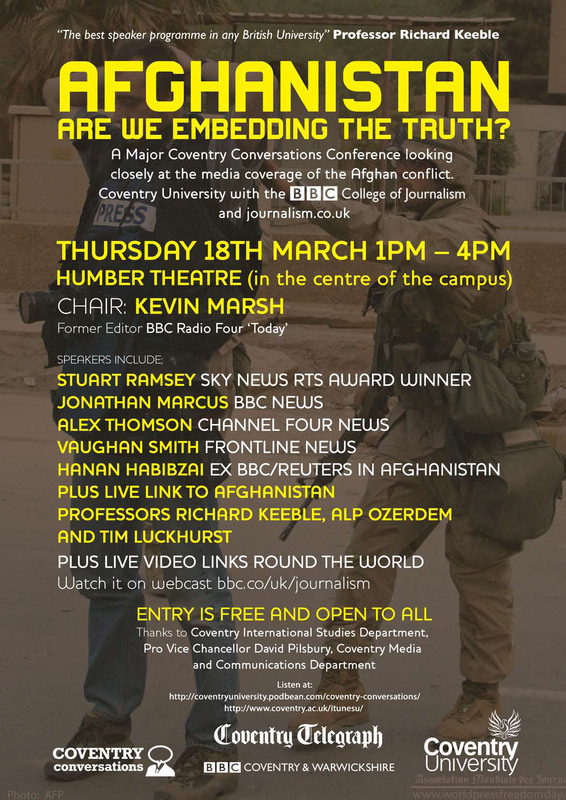 This entry was posted in Broadcasting, Events, Journalism and tagged Afghanistan, alex thomson, BBC College of Journalism, Coventry, Jonathan Marcus, Stuart Ramsey, War in Afghanistan on March 15, 2010 by Judith Townend. Some more simple and effective use of social media tools (and personality) from the team behind More 4 News. We’ve covered Channel 4 News’ use of Twitter before and its crowdsourcing experiments – but yesterday sister channel @more4news got in on the act. Responding to the launch of a 20-page guide for the UK government on using Twitter, @more4news issued a challenge to the 12 departments using Twitter: to sum up their current priorities in 140 characters. The responses were later used by presenter Alex Thomson (@alextomo) in an evening broadcast on More4. Four government departments don’t tweet it turns out (including the department for culture, media and sport), but there were replies from the treasury, ministry of justice and ministry of defence amongst others. 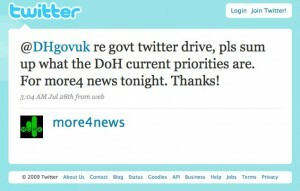 “We were pleasantly surprised at the way government departments rose to the More4 News twitter challenge. It’s clear that several of them have recently appointed Digital Media Advisors from among the twitterati,” Michael Hodgkin, assistant programme editor, More4 News, told us in an email. “Some of the summaries may sound a bit like promoting motherhood and apple pie, but what can you expect in 140 characters? It’s probably a very good exercise to have to sum up one’s aims so concisely. This entry was posted in Social media and blogging and tagged alex thomson, assistant programme editor, Digital Media Advisors, Michael Hodgkin, more4 news, social media tools, the More4 News, Twitter, UK government on July 29, 2009 by Laura Oliver. In preparation for the channel’s evening news bulletin, why not do some light pre-show reading as recommended by presenters Alex Thomson and John Snow? As part of the programme’s daily email newsletter, Snowmail, links are provided to background articles on the day’s agenda, albeit all taken from the Channel 4 website. This entry was posted in Online Journalism and tagged alex thomson, John Snow on September 13, 2007 by Laura Oliver.